Performers include: Rino Romano, David Sobolov, John Payne, Brian Drummond, Gary Chalk, Michael Donovan, James Crescenzo, Scott McNeil, and David Hayter. Peter Parker (Rino Romano) covers the launch of John Jameson’s (John Payne II) one-man mission to Counter-Earth (another Earth on the opposite side of the sun). Villains Venom (Brian Drummond) and Carnage (Michael Donovan) board the shuttlecraft so Spider-Man attempts and fails to stop them. Blamed for Jameson’s losing contact with our Earth, Spider-Man is persecuted by the media and the public. 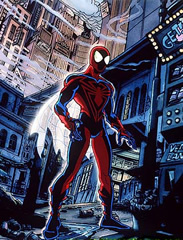 Peter is believed dead after he heroically saves a life in a fire so he goes on a mission, as Spider-Man, to retrieve John from Counter-Earth. Once there, he learns that humans are a second-class minority and that the planet is ruled by Beastials, a species of animal and humanoid hybrids. He finds John but he’s committed to stay to help the humans. Spidey elects to remain as well and finds himself battling Beastial versions of his old foes.